In 2018, NYRR is celebrating 60 years of helping and inspiring people through running. Last month, we explored the 1970s, a decade of tremendous change for NYRR, and in January, we chronicled the organization’s humble beginnings. This month, we look at five dates that defined NYRR in the 1980s. After starting in Macombs Dam Park in the Bronx in the 1950s and renting office space at the West Side YMCA in Manhattan in the 1970s, NYRR opened its new headquarters in 1981—a six-story brownstone at 9 East 89th Street, just steps from Central Park. The 14,500-square-foot building was known as the International Running Center and included a library of materials on running, a room for exhibiting running-related art, and a space for research on running injuries. It also functioned as a clubhouse—a place for runners to meet before and after their runs—and the location for bib pickup for races. And it provided offices for the ever-growing NYRR staff and a warehouse for its large stores of equipment and supplies. The Beaux Arts building was designed by Oscar Blumner (also a modernist painter and a designer of the Bronx Borough Courthouse) and completed in 1903. After a series of private owners, the building was sold to the American Institute for Iranian Art and Archaeology in 1942; five years later, it was purchased as a gift by the American Friends of the Hebrew University. The Child Study Association of America owned 9 East 89th Street from 1959 to 1972, and Reuben Fine, a chess grandmaster and psychologist, operated the Center for Creative Living, a mental health clinic, there before selling the property in 1980. NYRR certainly needed larger quarters than its few rooms at the West Side Y. The 1980 New York City Marathon had more than 12,500 finishers, and NYRR membership had surpassed 20,000. The building had a large lobby, conference rooms, even spaces for fitness classes—and room for the staff to grow. NYRR did eventually outgrow 89th Street and rented additional space in several Upper East Side locations, as well as warehouse space in the Bronx. In 2013, with a staff of more than 160, nearly all the organization’s operations consolidated to offices on West 56th Street in Manhattan, and in 2017 signed a long-term lease on 40,000 square feet of warehouse space in the Bronx. As East 89th Street was listed for sale, it continued to serve as the location for weekly race number pickup until 2015. Today, the legacy of NYRR’s original headquarters lives on at the NYRR RUNCENTER featuring the New Balance Run Hub. Opened in 2016, the year-round community space offers weekly race number pickup, a New Balance retail store, and hundreds of free running-related programs to serve runners in the five boroughs and beyond. With 60,000-plus NYRR members and more than 50,000 finishers in the TCS New York City Marathon, the new space on West 57th Street aims to share Lebow’s vision and NYRR’s mission with even more runners in the years to come. 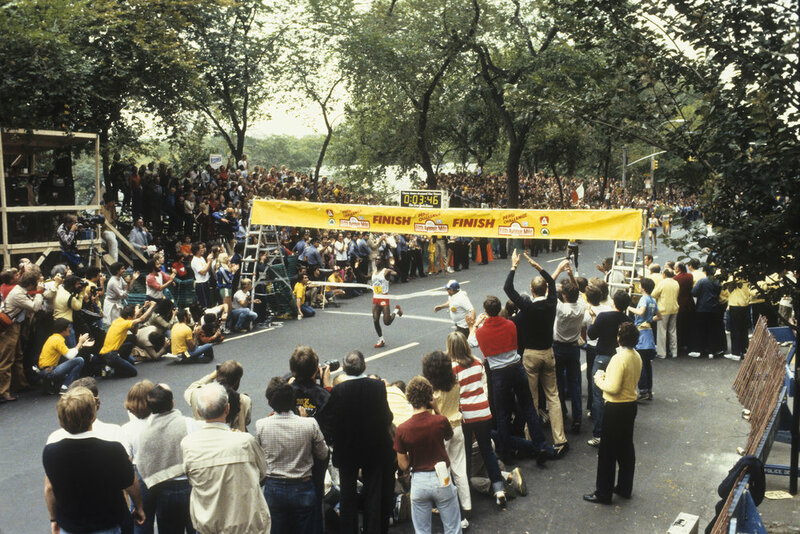 The inaugural 5th Avenue Mile, held on September 26, 1981, brought together one of the best fields of milers in history. Sydney Maree of South Africa, an eight-time NCAA champion at Villanova University who later became a U.S. citizen, won the race in an astonishing 3:47.52—a time that’s still the event record. In the women’s race, American Leann Warren broke the tape. Lebow approached city officials with the idea of a mile road race on 5th Avenue, starting at the Metropolitan Museum of Art and finishing 20 blocks south, near Grand Army Plaza. It took months of negotiations to confirm the event and line up sponsorship by Pepsi and The New York Times and live national television coverage on ABC-TV. A crowd of spectators estimated at 100,000 and a broadcast audience in the millions watched Maree’s thrilling triumph (sadly, the women’s race received no TV coverage). Once again, NYRR’s pioneering efforts were a spectacular success. “The event was instantly established as an annual celebrated race and quickly spawned an international circuit of city street miles,” Lebow wrote. 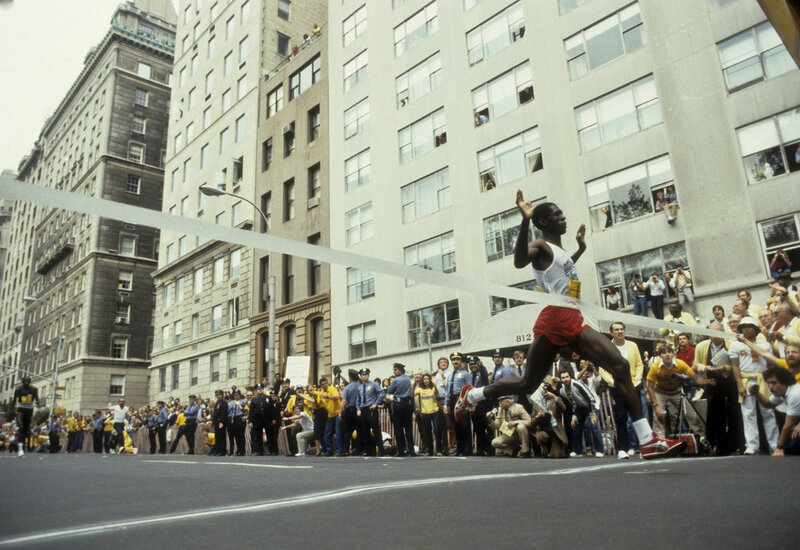 Throughout the 1980s the 5th Avenue Mile remained an invitation-only race—in addition to the professional heats it included “metropolitan” divisions for men and women, who could qualify through a series of trial races held during the summer. The first open (non-invitational) 5th Avenue Mile took place in 1992, but it was unscored. The first scored open race, in 2000, had 774 finishers. The 2017 New Balance 5th Avenue Mile had 7,717 finishers competing in nearly two dozen heats and was televised live on NBC-TV. Each year, exciting performances from world-class athletes—including six-time event champion and Olympic bronze medalist Jenny Simpson and Olympic gold medalist Matthew Centrowitz—continue to draw crowds to New York’s famous thoroughfare. The first Pride Run marked the start of an ongoing alliance between NYRR and Front Runners New York, the city’s competitive and social club for LGBT runners, multisport athletes, and their allies. Founded in 1979, the group got its name from Patricia Nell Warren’s 1974 novel The Front Runner. During the summer of 1981, several Front Runners New York members had traveled to San Francisco to run the city’s second-annual “Gay Run,” hosted by Front Runners’ founding chapter. They returned to New York eager to put on an event of their own—and the following summer, they did just that. Logo and poster designed by FRNY member Sue Foster, who was also the first woman to cross the finish line of the five-mile race in 31:49. 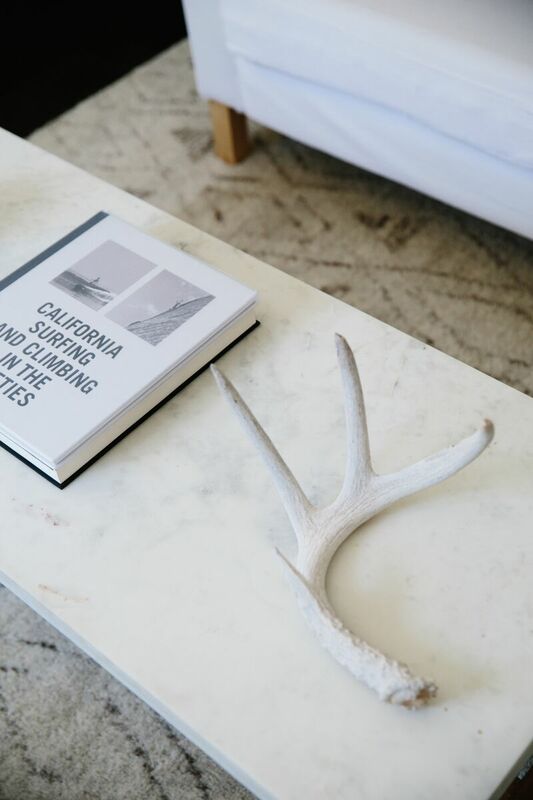 All of us here today have been running all our lives, straining every fiber, racing to stay ahead of institutions and people in the world who seek to enslave the human mind and heart… who seek to make us all live in fear, so that they can control our lives and our efforts. Staying ahead of these institutions, these would-be controllers, is the effort that we all are making. We are all front runners. The tradition continues today. On Saturday, June 23, 2018, more than 5,000 runners will take on five miles in Central Park at the 37th annual Front Runners New York LGBT Pride Run. By the dawn of the 1980s, the New York City Marathon was attracting the best distance runners in the world. But while Norway’s Grete Waitz dominated on the women’s side, the men’s race had never had a non-American champion. That would change on October 23, 1983, when Rod Dixon of New Zealand, running only his second marathon, used a sit-and-kick strategy to win the New York City Marathon in spectacular fashion. In New York, Dixon started conservatively on a cool, rainy day. At 20 miles he was two and a half minutes behind leader Geoff Smith of Great Britain, also an accomplished track runner. Gradually, patiently, Dixon reeled Smith in, waiting until the 26-mile mark, in sight of the finish line, to make his final move. Dixon finished in 2:08:59 and raised his arms in victory as Smith finished nine seconds back and crumpled to the ground in exhaustion and defeat. The image remains a classic symbol of triumph and suffering in sport. Norway’s Grete Waitz was the world’s first great woman marathoner, and the first world-class track athlete to attempt the distance. When she came to New York in 1978 to run her first marathon, Waitz didn’t just win the race—she set a world record (2:32:30). Afterward, she swore she’d never run another marathon, but she reconsidered, returned to New York in 1979, and lowered her own world record by another five minutes (2:27:33), becoming the first woman in the world to run the marathon in under two and a half hours. In 1980, she bested her record once again (2:25:41). 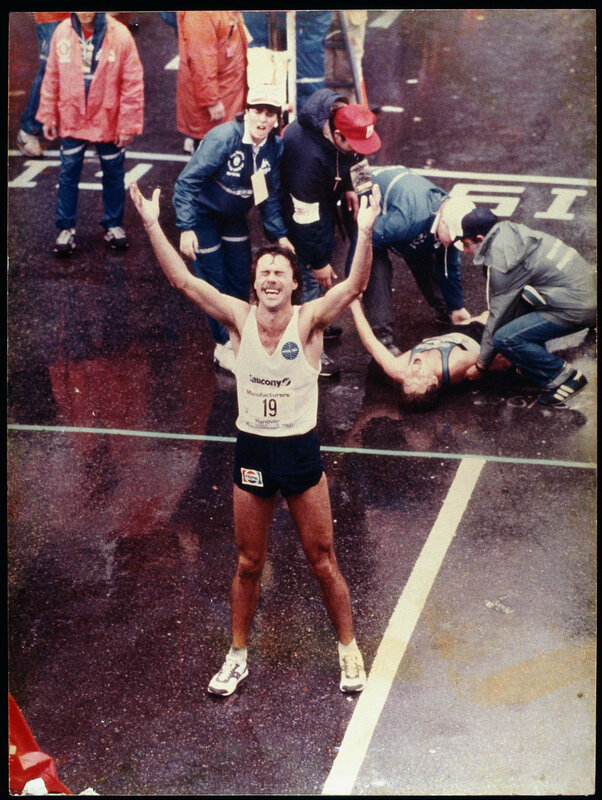 Waitz would go on to win the New York City Marathon six more times. At age 35, she recorded her ninth and final win in New York on November 6, 1988. While Waitz attempted a tenth victory in 1990, she finished fourth and retired from serious competition. Over her nine victories, her average margin of victory was four minutes and 29 seconds, and no challenger finished closer than 66 seconds behind her in New York. Though her life was cut short by cancer in 2011, Waitz still holds more New York City Marathon victories than any other runner in history.